There have been sleepless nights. Many sleepless nights. Selling sports bikes in profitable numbers is difficult nowadays. Fortunately for us; just as the Europeans were getting ready to open the champagne – the Japanese have mounted a serious counter attack. All four manufacturers now offer machines with Inertial Measurement Unit (IMU) enhanced electronics. This is good for us mortals, it makes a near 200Hp bike a lot more forgiving. 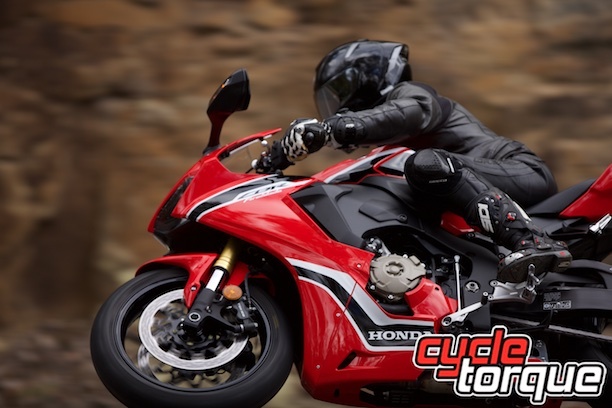 Honda has joined the fight with its new Fireblade. 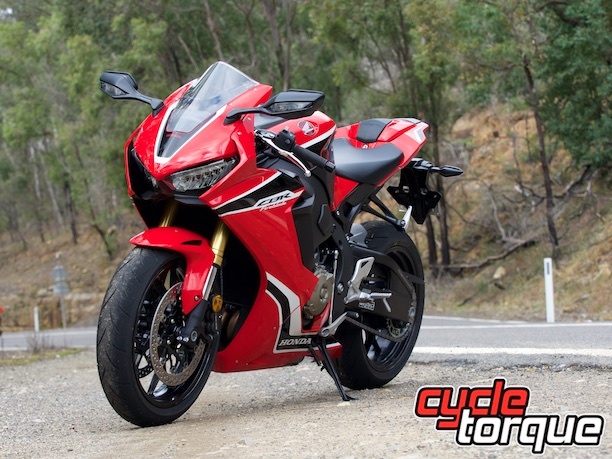 Their approach when bringing the new CBR1000RR to market, was to opt for a major rework of the existing design. This avoids many of the costs and possible flaws of an ‘all-new’ design. Existing strengths are maintained, and weaknesses overcome. Honda has done this before. 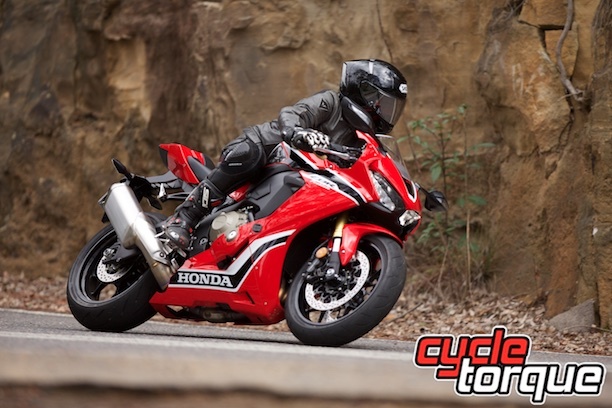 In 2007 the CBR600RR was updated, with a small amount of weight shaved from most components. The result was a great leap forward in power to weight ratio, and, no exotic materials required. This was so effective, that bike, is still being sold 10 years later. This time around with the 2017 Fireblade, Honda has taken a three-pronged approach to regain competitiveness. In addition to the diet – and the IMU enhanced engine/chassis electronics package – the engine has had a serious upgrade. There are also SP models, with active suspension (SP1 and 2) and forged wheels (SP2 only). All guns blazing then. But, is it enough? There’s a new frame. Not as exciting as more power, but possibly more important for a superbike. At extreme lean angles, even the best suspension struggles to absorb bumps and maintain grip. Carefully engineered frame flex can assist by allowing the tyre to deflect over imperfections – maintaining tyre edge grip. The new electronic package, the first for Honda on its mainstream sportsbike, has a full suite of features. This unfortunately means, it also has a full suite of acronyms… Honda will want you to know about: HSTC, RMSS, TBW, EB, APS, RLC, and IMU (as mentioned earlier). You’ve probably got ABS sorted. However, this stuff is important, and despite the linguistic complexity – it does make life easier for the rider. I’m an ‘Electronics for Dummys’ kind of guy, so I’ll break this electronic intervention down to two basic parameters: Go and Stop. There are five power modes (three are fixed – more detail on that in a moment), nine levels of traction control, and three levels of wheelie control. To simplify all this choice, Honda has locked wheelie control settings to traction control. 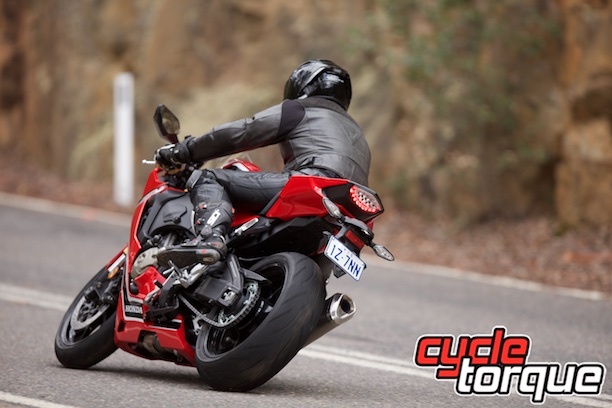 It’s not individually adjustable; so, more traction control, equals more wheelie control. Just a quick comment on wheelie control in general. As much as we all love a good wheelie, it’s not so great if it happens when you’re on the gas, and cranked over exiting a corner. If the front comes off the ground, brutal head shake can occur, followed by an… ‘ah-oh, I’m on my arse’ moment. Electronics aside, these’ll make ya stop! The ABS ‘talks’ to the Inertial Measurement Unit. Therefore, it’s very good at determining what action the ABS should take at various lean angles – as opposed to basic ABS, which just tries to keep the wheels rotating. This ability to discuss the braking situation with the IMU, also means Rear Wheel Lift Control (RLC) has been included. Keeping the back wheel on the ground during extreme braking is a nice bit of insurance. In any braking situation not involving A grade riders and a race track, having the back wheel come off the ground usually means the back wheel will try and overtake the front. That never ends up well either. The electronics also gives you programable engine braking (EB). If you chose minimal engine braking, then the bike will maintain its composure on corner entry, and the transition back to the throttle is much smoother (as the throttle butterflies are already opened a tiny bit, the usual “jump” as they come off the stop is eliminated). As all the ‘stop’ acronyms join, and work as a team – the rider can smoothly decelerate and tip-in to the corner like a pro, every time. Fabulous! The three pre-set modes are: Mode 1 (track) with Full power; Mode 2 (winding road) has power reduction in gears 1 to 3; and finally, Mode 3 (street/wet) with power reduction in gears 1 to 4. Traction control and engine braking are interlocked with these modes, and intervention is increased as you move from track to street modes. There are a further two modes that can be tailored to individual needs. This allows precise set-up for those who want it. A great feature, often not included on the competition. Now for the motorbike part. 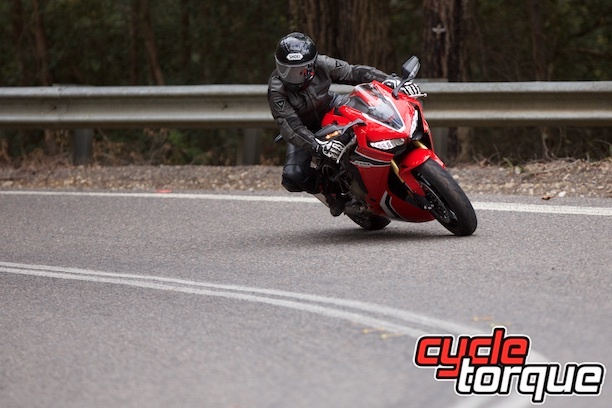 This report is from a road riding perspective as opposed to a track test. However, I can tell you from my road impression that it has more track capability than most riders have talent (myself included). If serious track speed is your only concern, you can purchase with confidence. However, if a number-plate is to be attached; most readers need more. So, what is the real world trade-off for access to all that performance? One thing this class of bike must have, is the engine for the job. The previous model ticked the box, but the engine could have been produced by Toyota. It was adequate in (superbike terms), and it never gave any trouble. Adequate still means it would rip your bloody arms out. MY17 brings another 11 ponies to the table. This extra power has been won by the time-honoured approach of higher compression and engine rpm. The transmission can be a bit clunky at low engine speed, especially when cold. The test bike had very low kilometres on it, and that wouldn’t help. It’s a different story once you escape the urban area. At speeds above 60Km/h it transforms into one of the best gearbox/clutch combinations I have experienced. The action is light, the throw short, and the slipper clutch makes downshifting a joy (especially when minimum engine braking has been selected). The accessory Quickshift up/down option will take it to the top level, but for street only riding, it’s not ‘really’ required, but I’d get it anyway, just because. This model has the ‘poverty pack’ suspension, active suspension is available on the higher spec SP models. That doesn’t mean it’s not good. If you are riding around in circles (like… on a track) carefully dialled, quality suspension doesn’t give away too much to active suspension, and it’s generally lighter. By fitting Showa Big Piston forks (43mm) and a Balance Free rear shock; Honda is on the same playing field as its Oriental competition. As I’m 65 Kg, fine tuning suspension settings is mandatory and the Fireblade was no different. I look for responsiveness to setting changes. Having trick adjusters is all very well, but it’s better if something happens when adjustments are made. Happily, I can report this is the case. The OEM setting is too firm for Australian B roads. As a base track setting, it’s probably close to the money. I wound the damping adjusters back to minimum. This allows the wheels to move more quickly over road deformations. The ride becomes less harsh and more compliant. There was no wallowing on these settings, and good wheel control. For road riding, I’d recommend owners start here and increase damping if required. Ergonomically, it sits at the low end on the sportsbike ‘punishment’ scale. The bars are as high as they can be, before its race bike functionality would be compromised. A good mix of comfort and road feel is on offer from the seat. 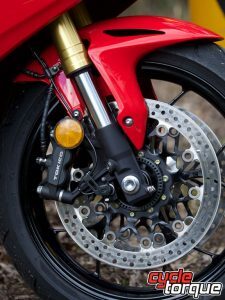 The knee angle is about as open as you’re going to get on a superbike and the diminutive fairing works way better than you’d think. However, Honda could really improve this by adding height-adjustable ‘pegs. The TFT screen dash is superb. All the info you want, with some flexibility in configuration. Even in full sun; my dinosaur eyes can read it. The tacho isn’t as easy to see with your peripheral vision as some of its competitors. For road use it’s fine. All the elements Honda has improved work well together. The set-up I liked was Mode 1 (maximum power and minimum engine braking) and suspension damping at minimum. This gave smooth on/off power transitions with maximum grip on the less than perfect Putty Road. If it were mine, I’d do a user map with Mode 2 power (which cuts some high RPM power in the lower gears) and minimum engine braking. On twisty roads, you’ll never use full power, and if you insist, it will get you into trouble. This year, the engine is in another league. It’s still a bit Toyota-ish – very smooth and bulletproof, but now there’s some serious mumbo included as well. How much? In Mode 1 (full power); pin it in third, and it will lift the front wheel a metre of the ground, and hold it there till the redline. This will impress your mates, guaranteed. It’s good to see Wheelie Control doesn’t disable your inner hoon either. I did unintentionally explore the traction control (Selectable Torque Control in Honda-speak) and it worked beautifully. There was a high-speed sweeper, which was taken at a high-ish lean angle. When power was applied, some nicely controlled over steer resulted. This sort of stuff is outside my talent envelope, so the electronic nanny works very well. Incidentally, there were skid marks – sadly, they weren’t on the road. The brake package is excellent. Great power, without savage initial bite. All the open class sport bikes have fantastic brakes, but I don’t think any would be better than the Hondas. The bike’s compact fairing, reduced and centralised weight gives it a feel and agility that is almost 600 supersport-like. It will change direction as quickly as you can move your weight. You don’t feel it dragging behind, resisting your inputs. For urban riding, it’s not as bad ergonomically as you’d think. While it’s certainly not comfortable, no genuine sportsbike truly is, it is tolerable for short stints. It comes with the territory. If you are fit and have a light helmet, the distance to the pain point will be longer. Back pack commuting is achievable – if you can resist the call of the throttle. If you can’t, you’ll soon be catching buses. I believe this bike nails its design brief. It’s not perfect and a longer period with it may reveal some annoyances that aren’t immediately apparent. The flaws it does have are not deal breakers. For instance, the mirrors aren’t great, but if that’s at the top of your priority list, there’s something wrong. The pipe at idle won’t impress many people either. A few other positive things I noticed: Right angle valves are fitted (thank you so much Mr Honda); the tank has knee grip pads (a really, nice touch); removing the mirrors and tail piece for track days looks to be an easy, 10 minute job. 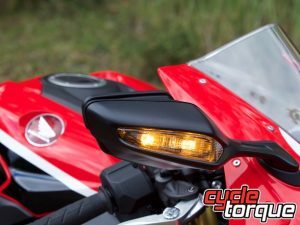 Where does the Fireblade sit in the sportsbike world? As it comes from the largest manufacturer: it is an important bike. To be successful it needs to be achieve two things. It needs to be fast, and it is; but more importantly, it needs to sell. This is true of every sportsbike. The whole category is at risk of being uneconomic for manufacturers. We don’t need another Commodore/Falcon situation where good, affordable product just didn’t sell. Bikes like this just may reinvigorate the sports bike sector, and if you’re a racer or fan, this is good news indeed.